Fracking and finance: can investor-activism reshape energy governance? Abstract: Shareholder resolutions—usually non-binding requests to corporations for changes to environmental, social, and governance practices—have taken on new significance as financial actors gain increased power in commodity chains. With a focus on shareholder resolutions on hydraulic fracturing in the US, I argue that these investor actions are part of a suite of coordinated and adaptive activist strategies to shape environmental governance from within. However, their power is constrained by the same political economy factors that enable shareholders to take collective action: the distance between individual investors and financial decisions; the structure of resolutions and managerial responses; and the complexity of investment vehicles and vote shares. This work joins an emerging body of research on investor-led governance and social movements, revealing the opportunities and limits of financial actors in shaping both corporate behaviour and energy systems. 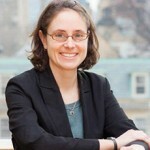 Kate J. Neville is an Assistant Professor in Environmental Politics at the University of Toronto, cross-appointed to the Department of Political Science and the School of the Environment. Her research investigates the intersection of global markets and local places, with a focus on natural resources and energy. Through examining the global rush for biofuels and the so-called “shale gas revolution,” among other contested resources, her work brings together political economy and social movement scholarship to better understand how new commodities and technologies link local communities and ecosystems with global institutions and networks.